You are browsing the archive for OK Belgium. The next edition of Open Belgium, a community driven conference organised by Open Knowledge Belgium, is almost here! In less than 4 weeks, 300 industry, research, government and citizen stakeholders will gather and discuss current trends around Open Knowledge and Open Data in Belgium. Open Belgium is the ideal place to get an update on local, national and global open initiatives as well as to share skills, expertise and ideas with like minded data enthusiasts. It is an event where IT-experts, local authorities, Open Data hackers, researchers and private companies have the chance to catch up on what is new in the field of Open Knowledge in Belgium and beyond. It’s a day where data publishers sit next to users, citizen developers and communities to network and to openly discuss the next steps in Open Knowledge and Open Data. To make sure that you will get the best out of a full day of talks, workshops, panels, discussions and, not to forget, networking opportunities, we post daily blog posts of all that is going to happen on the 12th of March. Check out the full programme here. From Open Knowledge International, Serah Rono (Developer Advocate) and Vitor Baptista (Engineering Lead) will host the hackathon session “Using Frictionless Data software to turn data into insight”. OKI’s Frictionless Data (frictionlessdata.io) initiative is about making it effortless to transport quality data among different tools & platforms for further analysis. In this session, they will introduce Open Belgium community to software that streamlines their data workflow process and make a case for data quality. You will learn how to add metadata and create schema for their data, validate datasets and be part of a vibrant open source, open data community. Do you want to be part of the open community? Attend talks from excellent speakers? Meet other open experts and interested peers? Find inspiration for your projects? Or just keep the discussion going on #OpenBelgium? Be sure to join on the 12h of March in Louvain-la-Neuve: there are still tickets left here. This blog post is part of our on-going Network series featuring updates from chapters across the Open Knowledge Network and was written by the Open Knowledge Belgium team. A lot of things has happened over the past few months at Open Knowledge Belgium. First, we welcomed Dries Van Ransbeeck as the new project coordinator. His previous experience ranges from data modelling, civic engagement to crowdsourcing. He also has a keen interest in open innovation and the power of many intrinsically motivated individuals contributing to projects with social and societal impact, serving the interests of the many rather than the happy few. Our annual conference was held on March 6 in Brussels, with the theme: ‘Open Cities and Smart Data’. There were talks and discussions about how Open Data can contribute to smart urban development, the rise of smart applications and the shift from raising the quantity of data to raising the quality of data. About 300 industries, researchers, government and citizen stakeholders were expected for the conference to discuss various open efforts in Belgium. More will be shared later. An interesting Kickoff meeting about Open Education was held in February to discuss the possibilities of opening up educational data in Belgium. This bottom-up action is needed in order to make things possible and keep the discussion alive. Business owners, data providers, data users and problem owners sat together and discussed the possibilities concerning open educational resources (OER) and open educational practices. While students and staff want information which is up-to-date and easy to find, most colleges are unwilling to open up their data which is very problematic because opening up educational data to build applications would make things a lot easier for students as well as the colleges themselves. Another issue that was identified is the fact of every educational institution working with a different database. It was, therefore, interesting to discuss an open data standard for every college or university. We can solve these problems by giving educational institutions more concrete information about what data they have to open up and what the consequences are. Therefore, this working group could contribute to the discussions on the possibilities of Open Education and create extra pressure on colleges and universities to open up their data and provide them with more information. The biggest achievement for OSM Belgium in 2016 was co-organizing SOTM (State of the Map) in Brussels, which is the yearly international conference on OpenStreetMap. Our community for OpenStreetMap is growing and thanks to the help of many enthusiastic volunteers, SOTM was a great success. For 2017, OSM plans to formalise their organisation by setting up a membership and some very basic governance rules. By doing this, they want to provide some structure and support for future projects. OSM will continue to stay an open community as it always has been. The main goal of OSM is to communicate in a better way about their ongoing projects so as to attract sponsorships for the new year. They’re also collaborating more closely with other organisations which share the same goals. We have also recently started a new working group who wants to help spread the use of Open Badges in Belgium. An Open Badge is a digital platform where you can showcase the talents you have acquired and share them with the labour market. They are visual tokens of achievement or other trust relationship given by training centres, companies and selection agencies and are also shareable across the web. Open Badges are more detailed than a CV as they can be used in all kinds of combinations, creating a constantly evolving picture of a person’s lifelong learning. To learn more about how Open Badges work, watch our introductory video here. Oasis is the acronym for ‘Open Applications for Semantically Interoperable Services’. This is a cooperation between the city of Ghent and the region of Madrid to increase the accessibility of public services and public transport. Both cities work together and publish linked open data to prove that new technologies can lead to economies of scale, such as the creation of cross-country applications. To read up on Open Knowledge team and our activities please visit www.openknowledge.be or follow us on Twitter, Facebook and Linkedin. For the first time in history, we can hack from inside the Council of the European Union building! 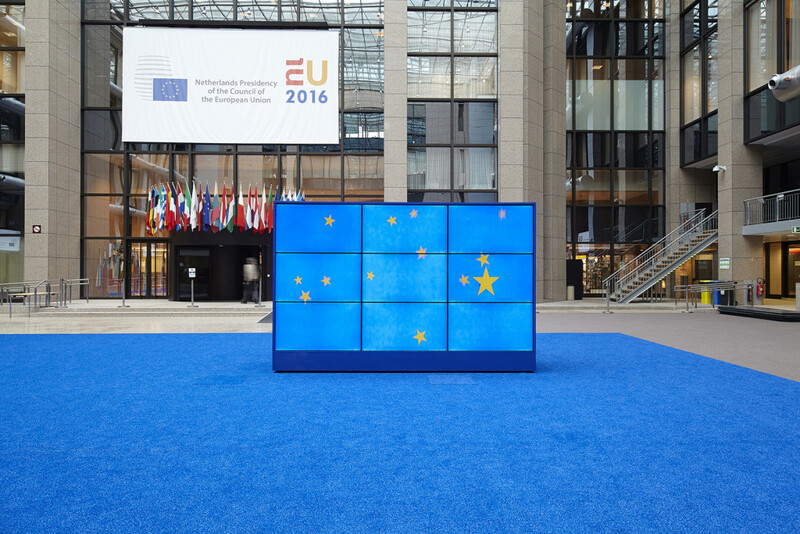 Join us at #Diplohack in Brussels in the Council of the European Union on the 29-30 of April. We invite everyone to take part, whether you’re a diplomat, developer, designer, citizen, student, journalist or activist. We will connect different profiles together in teams to use European data for good. The idea is that you create a prototype or MVP (minimum viable product) with this data in just 24 hours that is focused on transparency and decision-making. We will support you in any way possible, explain the data and help you get started. Diplohack, as the hackathon is called, forms part of the Dutch Presidency of the Council of the European Union transparency strategy. The Brussels diplohack will run for 24 hours straight and is part of the several Diplohacks across Europe. Those hackathons intend to make the EU more transparent. Tech developers, EU diplomats, journalists, citizen activists, social entrepreneurs, data experts and many more will join forces and think of transparency applications to make decision making in the EU searchable and understandable. Everybody interested in the EU data can enter the hackathon. The winners of the diplohack will be invited to compete in a European final in Amsterdam during the TransparencyCamp Europe Unconference. The Diplohack event is organised the Council of the European Union, the Dutch EU Presidency and Open Knowledge Belgium. Get your free ticket for the #Diplohack! The Diplohack will be preceded by the Webinar with EU data experts to explain more about the data. You can join even if you don’t participate in the Diplohack itself. Register here. Check http://diplohack.brussels/ or the discuss forum thread more info on the programme and the Eventbrite page for more practical information.